Before Jesus went to the cross he prayed for unity. Let that settle in your heart. One of the last things on Jesus’ mind before he faced death was for people to have unity. 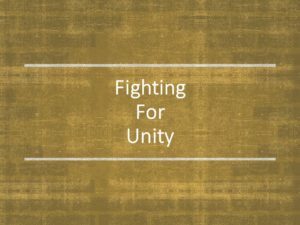 Are you as concerned about unity as Jesus was? Unity doesn’t come naturally, as Jesus’ prayer indicated, it is a spiritual battle. You have to fight for unity and the battle can be grim, but the victory is priceless. The reward is peace. Because fighting for unity is a spiritual battle the weapons used are unconventional. They don’t make sense in this world. Onlookers won’t understand. The weapons that we use are weapons of the Kingdom. In truth, many will try to disarm you with good intentions. They will appeal to pragmatism and merit. They will press you to take up the weapons of this world that sound thoughtful and sensible. Because of this is it is vital to hold on to faith, knowing that God is at work behind the scenes. God never sleeps, he is always at work. Recognize that when you choose to use a weapon of the Kingdom it will always land a devastating blow. This list boring. Most people, even those who don’t claim to know Jesus as their Savior, will nod in agreement. Who will challenge the thought of forgiving others and asking for forgiveness? Who would dare argue about the need to serve others. Even those who do not believe in God recognize that serving others is a healthy trait and is valued in societies across the globe. No, this list is boring. On the other hand, these weapons of the Kingdom ignite when they collide with the systems of the world. When you are hoping for a promotion at work the world scoffs at they idea of letting others go ahead. When the world positions itself in the political arena it is foolish to admit you were wrong. When the mob cries out against the villains of the world it is reckless to love them they way that Christ loved you when you were an enemy of the cross. Yes, this particular list is agreeable and boring. Nevertheless, it contains weapons of the Kingdom and when you begin to apply these principles and not just read them, be prepared. The world will fight back. Are you willing to fight for unity? Thanks, Mike, for this actionable reminder of where we put our trust.